To play your downloaded music, open the Music Player application on the Samsung Galaxy S 5. Just tap the Play Music icon. The first screen that you see sorts your music files into a number of categories. Playlists: Some digital music stores bundle songs into playlists, such as Top Hits from the ‘50s. You can also create your own playlists for groups of songs that are meaningful to you. Recent: This list is for the songs you most recently added to you collection. Artists: This category lists all songs from all the albums from a given artist. 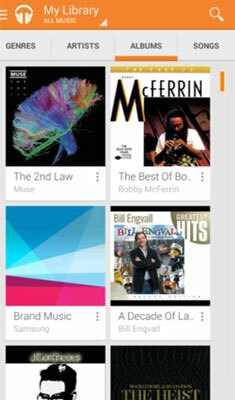 Albums: Tapping this category places all your songs into an album with which the song is associated. When you tap the album, you see all the songs you’ve purchased, whether one song or all the songs from that album. Songs: This lists all your song files in alphabetic order. Genres: This category separates music into music genres, such as country and western or heavy metal. These categories are useful when you have a large number of files. To play a song, an album, or a genre, open that category and tap the song, playlist, album, artist, or genre, and the song will start playing. Next to each song or album is a gray arrowhead pointing down and to the right. If you tap the three vertical dots, you get a pop-up that offers you several options. 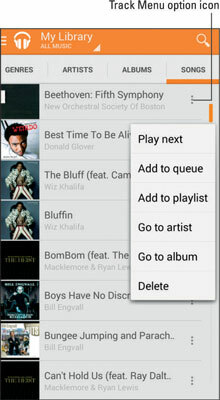 One is to create a playlist or add to a playlist. Tap the playlist option. You will be asked to name a new playlist or open an existing one.